Christmas Griddlers is rated 3.5 out of 5 by 11. Rated 5 out of 5 by LanaPook from I love Griddlers! Long after I have finished other games the Griddlers goes on! This is a very challenging game. It is frustrating some times and that just makes it more fun when I win. If you likes the others try this. 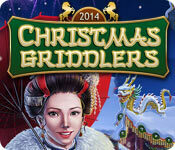 Rated 5 out of 5 by backgammonnut from CHRISTMAS GRIDDLE If you liked Asian Riddles, you should like this game. I have only played the demo for A few min., but I did notice that it looked like the background of Asian riddles and added Christmas deco to it. You can use the right mouse button to switch back and forth between the marks. However, I did notice that the "x" doesn't show up until you take your cursor off the box. Rated 4 out of 5 by pennmom36 from Griddlers I'm a huge pic cross fan and this game was really good just not great, perhaps because it came out after Christmas. There are several "rooms" to unlock and each room has several levels to complete with the goal being to earn 3 stars. I will give this game kudos for a couple of aspects. I love the fact that the grids on each game are oddly shaped not just 10x10 etc. and you can go to the shop and get things like an extra mistake allowance or refill the hint meter. Rated 3 out of 5 by AdrianaIP from Slipping standards This developer is known for its griddler games. Up to now we knew not to expect to see the complete pictures, nor to have pretty colors. Or to have irritating music. We put up with all that because their puzzles were top notch. Games that could only be solved by pure logic, without guessing or using hints. Well, that is over and done with. Too many of them you NEED hints/ Sorry, but if I want those kind of puzzles, there are other developers that put out nicer griddlers. Rated 3 out of 5 by verimeri from christmas? These were just another version of griddlers. Need hints by level 20- cannot figure them out using logic. Maybe 1 out of every ten actually forms a picture that could be called Christmas. Rated 3 out of 5 by mrm2006 from Not really interesting. Create pictures by filling in blocks using a grid of numbers on the top, side and bottom of the game board. This game had nothing fascinating about it. Each "page" (10) has 12 sub-levels. You can receive up to 3 golden stars depending on your progress. Make a mistake, lose a star. There are 6 levels, each with 20 sub-levels. There is no difficulty mode. No story line, just a few cut scenes wherein we're supposed to guess what's going on. The only thing Jurassic I saw was the background and you could change your tiles to include a dinosaur. Yay. It's a typical Mahjong game with everything I dislike about this type. There are 3 stars you can achieve during each sub-level. Finish in "x" amount of time. Get "x" number of special (gold) tiles and earn "x" number of points. Very disappointing and definitely not a purchase for me. Only recommending so you can give it a try before you buy. Happy Gaming! Rated 3 out of 5 by robinbobbin from Poor user interface, great puzzles I love griddlers, nonograms, paint-by-numbers, whatever you want to call them. They're an ideal type of puzzle to translate to a computer game, but most of the ones I've played have not been very good. This particular game, like the others in the series, suffers from two main problems: one, there is no thumbnail view to see the completed picture, nor name/title, so there's no sense of accomplishment and they might as well be random puzzles instead of pictures. Two, the player interface marks off completed clue numbers BEFORE you have actually finalized them, leading to errors and mis-clicks. For example, if the clue for a row is 1 1 1 1, and you place 2 single squares in the row, it will mark the last two 1's as complete. You don't really know yet if those are the right-most squares or not, but the game says they are. This wouldn't be quite as much of a problem if there was an auto-complete that would fill in the X-es on a row or column where all colored squares had been placed; but there isn't. It also does seem like some of the puzzles are not true logic puzzles and either require guessing or could have multiple solutions. Given the many engines that have been written to create and check these type of puzzles, that's just inexcusable. These games are usually super easy, obviously trying to capture people who haven't played this type of puzzle before. But they need to step up the playability or they aren't going to draw in enough people to support advanced level games. Rated 3 out of 5 by xdoddleybugx from Pretty Average! 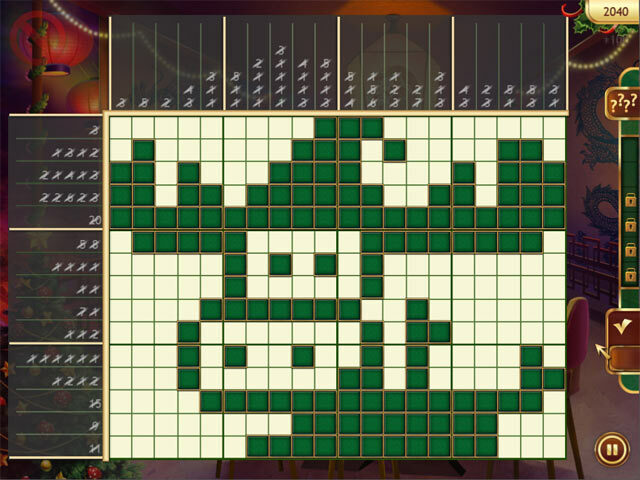 Usually I love these "griddlers" games (world mosaics anyone?) but I just didn't find this one that engaging. There's no story, which isn't necessarily a bad thing but it does mean that there's no purpose to the gameplay and the pictures aren't that clear on what they're supposed to be. Additionally there are times where I felt like I had to guess, which is always a negative for this kind of game. However I don't claim to be an expert so it could have been that I was just missing something. I enjoy the three star rating system personally because it appeals to my obsessive side that wants to collect everything. Similarly with achievements, I enjoy a game that offers replay value. Overall it was OK. It's fun for people that enjoy picross/griddlers, otherwise it doesn't really bring anything to the genre that hasn't been done before. Rated 3 out of 5 by JustTheFacts from A Bit Of A Disappointment BASED ON DEMO This is a standard issue 8 Floor production, with barely an air of Christmas atmosphere to recommend it. 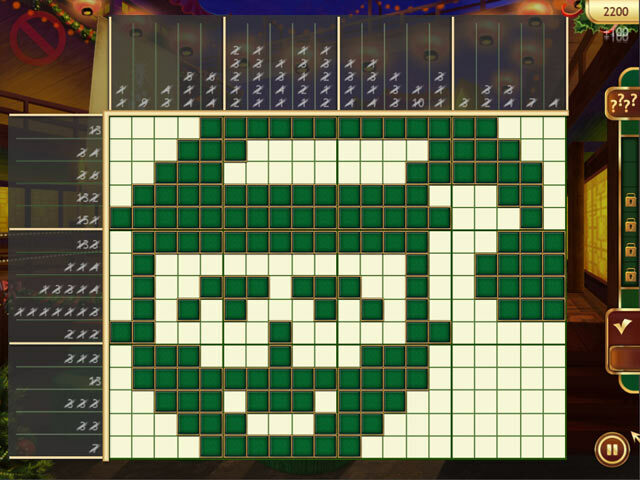 And while they always do a fair job, I would have expected more from this Christmas themed pictograph game. There are only 6 xmas backgrounds. 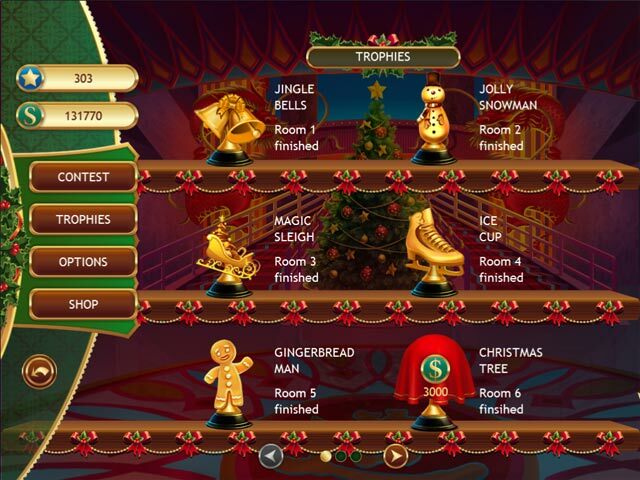 The only one I saw was an attractive formal xmas tree, but the locations (rooms) are just like Mahjong World Contest which they put out not too long ago - and all the interface etc. looks suspiciously similar to me. The game looks good, as all these games do, colourful and clear graphics, but no animation. The locations are mere background wallpaper, and there are only 6 of them, and that’s it for your Xmas theme. The images made by the grids may be xmasy but you can’t see them as they are whipped away to show the score page before you can get a good look. The music is not xmasy at all, despite what the blurb says. There are six rooms, each representing the next stage in your progress, each with 20 pictograph grids. They start off very easy, just 5x5, but there are also only a couple of hints and no more than 2 mistakes allowed, in these early games. As the games get harder, you are allowed more hints and mistakes. You are awarded a maximum of 3 stars for each level, and you need 3 stars on every level before you can gain access to the next room. The stars are granted based on 3 different measures: 1. A certain number of points 2. Earned so many $$ 3. Completed the grid in a set time Plus there are bonuses for not using hint and/or making mistakes. You can replay the level immediately or at another time to beat your previous rating, or you can use your $ to buy different powerups, such as mistakes allowance x3, in the shop. Also to gain access to higher levels you haven’t qualified for yet. There is a top score page as well, and achievements and trophies. As I say, all very much exactly the cookie cutter mold that is 8 Floor Games, and it is not even xmasy. I pass.